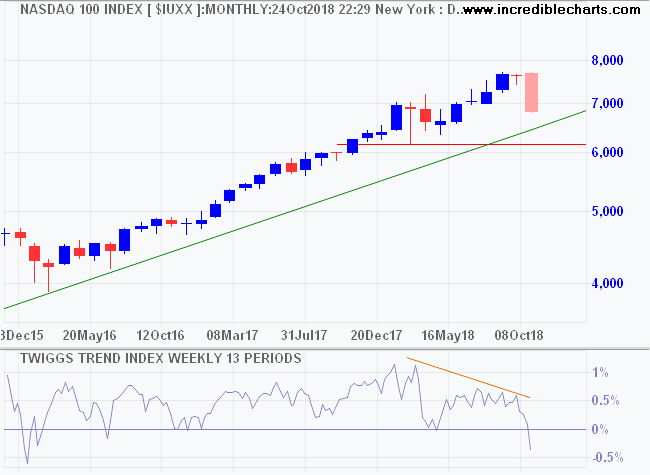 The earnings season has commenced several beats but market focus is elsewhere: on interest rate hikes from the Fed and deteriorating trade relations with China. 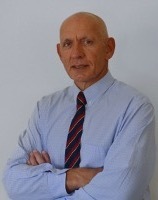 Selling is now feeding on itself, with sellers responding to lower prices by offloading more stocks. "You can't argue with the tape" as Jesse Livermore famously said. When fear moves the herd, logic and reason are the first casualties. 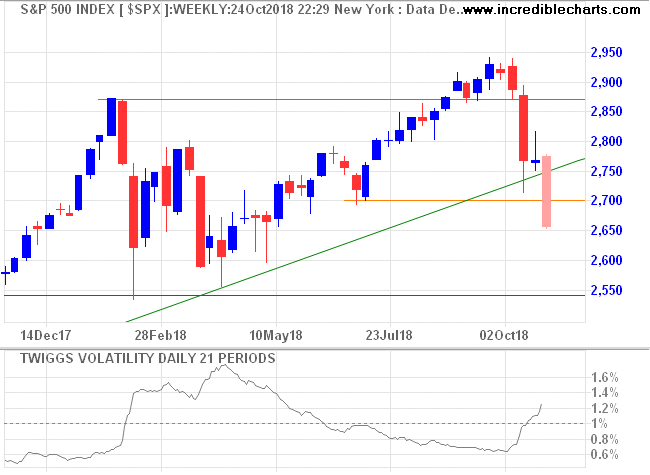 The S&P 500 broke support at 2700 and is likely to test the primary level at 2550. Volatility is rising but only a trough above 1%, formed over several months, would warn of elevated long-term risk. The market outlook has shifted to "risk-off" and technology favorites like Netflix and Nvidia are taking a beating. 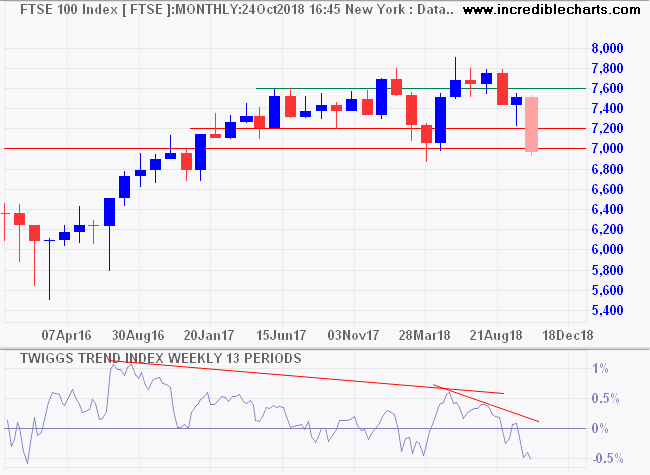 The Nasdaq 100 has fallen 900 points to 6800 and is likely to test primary support at 6300. 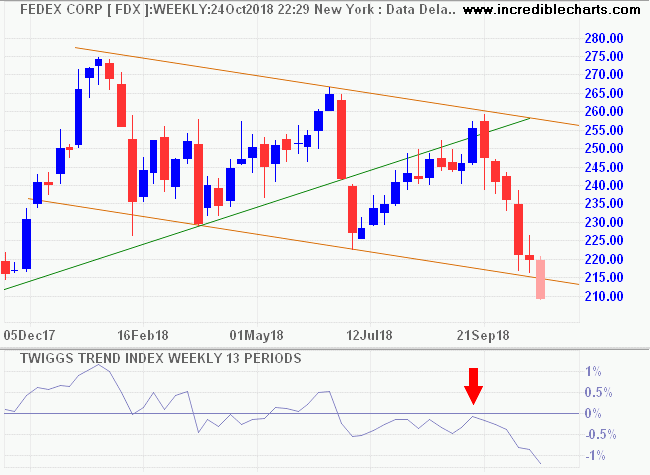 Bellwether transport stock Fedex broke downwards from its trend channel, warning of a broad market sell-off. 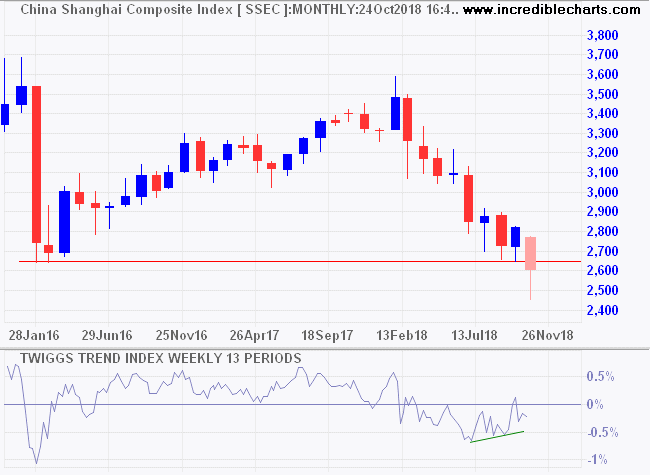 China is already in a primary down-trend, having broken primary support at 2650, but rising troughs on the Trend Index warn of strong support. I suspect this is government-orchestrated as investors have little reason for optimism. 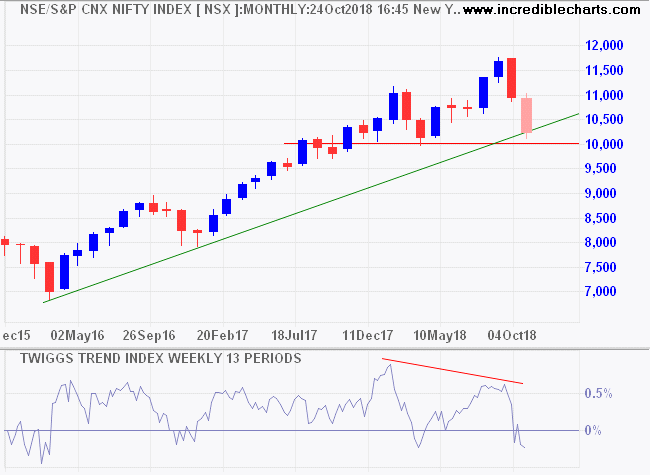 India's Nifty is still in an up-trend but testing primary support at 10,000. 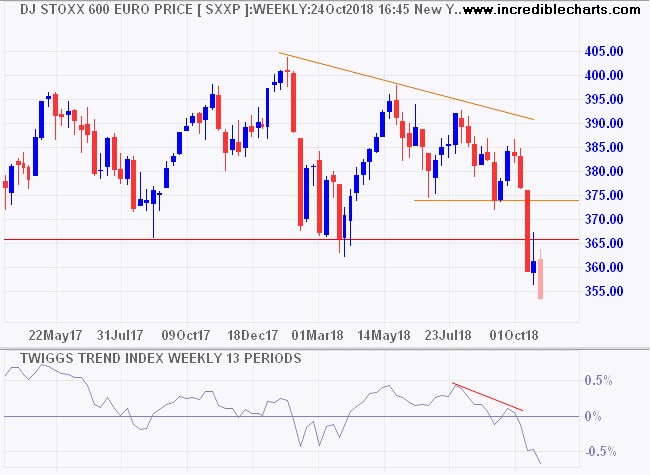 In Europe, the DJ Euro Stoxx 600 is in a primary down-trend after respecting new resistance at 365/366. 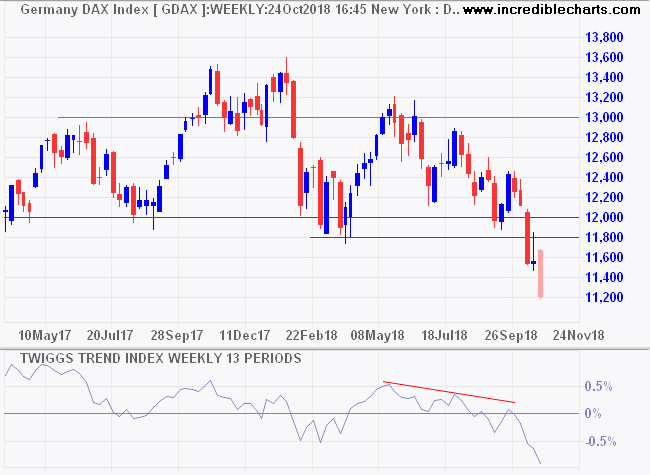 Germany's DAX is in a similar down-trend, having respected resistance at 12,000. 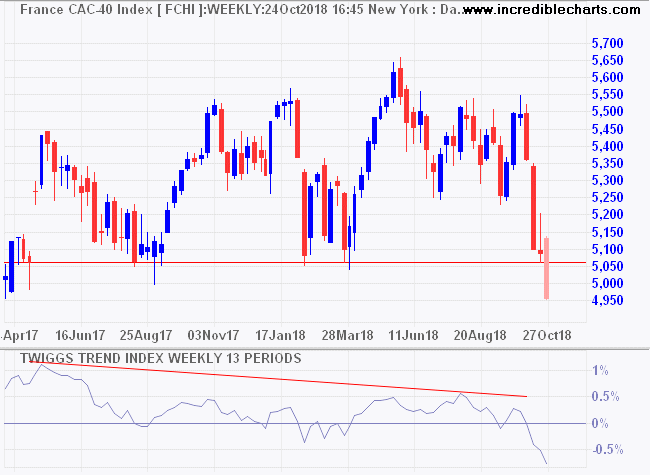 France's CAC-40 has joined in, breaking primary support at 5050. And the Footsie is testing primary support at 7000. It is important in times like this not to join the panic. Stick to your original plan. If you are a long-term investor, turn off the TV and wait this out. Earnings are rising and the economy is in good shape. Netflix (NFLX) for example added 6 million subscribers (4.8%) in the last quarter. As a business owner you wouldn't dream of selling. Look for opportunities when the stampede has ended and the dust has settled.